We work to reduce the number of traffic fatalities and injuries. We take our traffic safety message across Virginia encouraging drivers to focus on the road. Our outreach programs help new drivers develop safe driving habits. Nearly 20% of Virginia drivers don’t buckle-up. We educate drivers about the importance of safety belt use. We help businesses foster a culture of safety. We develop and produce traffic safety campaigns that we distribute across the Commonwealth. If you ever drive roads in rural Virginia, this video is a must-see. 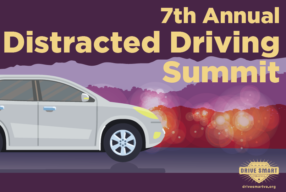 The 2019 Distracted Driving Summit will be held September 26 & 27 in Roanoke. Sign the Safe Driver Pledge and encourage others to drive distraction-free. Help us make Virginia’s roadways safer! Join with other businesses, organizations, and state agencies and become part of the Coalition! Our traffic safety campaign brochures, posters, and other items are free for Virginia residents. Even shipping is free!